CARSON, Calif. /California Newswire/ — International Trade Education Programs (ITEP), a nonprofit focused on connecting high school students to careers, was recently honored with the 2016 Bob Kleist Leadership Award by the Los Angeles Area Chamber of Commerce. Recipients of the prestigious award demonstrate inspirational and visionary leadership in the development of world trade in Southern California. 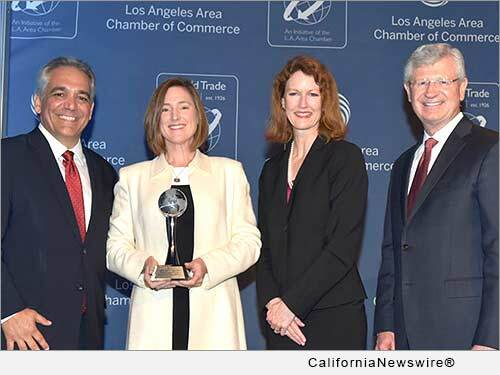 The award was presented during the 90th Annual World Trade Week Kickoff Breakfast on May 3 in Los Angeles. The annual breakfast kicking off World Trade Week (WTW) boasted its largest attendance to date with nearly 800 guests. Special guests included keynote speaker Alan F. Horn, Chairman of the Walt Disney Studios, emcee David Ono of ABC 7 Eyewitness News, U.S. Representative Ed Royce, and Los Angeles Mayor Eric Garcetti. In addition to celebrating the global trade industry, the event also awarded local youth with nearly $10,000 in high school and college scholarships. Four of the twelve scholars come from ITEP-supported programs at Phineas Banning High School in Wilmington, California. ITEP currently supports 13 high schools to bring career exploration activities, training opportunities, and paid summer internships to more than 5,100 students. "ITEP exemplifies all of the elements of the Bob Kleist Award through its visionary and innovative methods of preparing our youth for the future and should be a model to be duplicated globally! I am honored to be the WTW Chair in the year ITEP was awarded this prestigious award," remarked Anthony Pirozzi, Port of Los Angeles Harbor Commissioner and Boeing's Director of Systems Integration, Test and Launch. "ITEP's practical and outstanding educational services and guidance to our youth is the spirit and essence of the Bob Kleist award," added Carlos Valderrama, Senior Vice President of Global Initiatives of the L.A. Area Chamber. World Trade Week, an initiative of the L.A. Area Chamber, celebrates the international trade industry throughout the month of May with more than 30 events in Southern California. The month-long celebration is initiated by the Chamber's Annual WTW Kickoff Breakfast. WTW has dedicated itself to educating the public on the importance and benefits of global trade on the local and national economy. International Trade Education Programs (ITEP) is a Southern California 501(c)(3) non-profit organization that prepares high school students for diverse career opportunities in high-growth job sectors. ITEP develops innovative programs that integrate internships and career mentoring with the curriculum of area high schools. Since 1999, ITEP has consistently connected industry and community leaders to the classroom for hands-on learning. For more information on ITEP, please visit http://www.itepinc.org/. PHOTO Caption: Left to right: Harbor Commissioner and 2016 World Trade Week Chair, Anthony Pirozzi of Boeing; Amy Grat, CEO of ITEP; Julie Anne Hennessy of the U.S. Dept. of Commerce; Gary Toebben, President & CEO of the Los Angeles Area Chamber of Commerce. Photo credit: Los Angeles Area Chamber of Commerce.